Recognized the world over by frequent flyers and armchair travelers alike, Eyewitness Travel Guides are the most colorful and comprehensive guides on the market. Do you enjoy adventures? 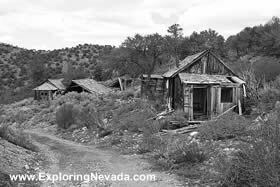 Do you enjoy ghost towns and very isolated yet scenic locations? Do you have a 4WD vehicle and know how to use it? If you answered yes to all three of these questions, well I have a scenic drive with your name on it. The Sprucemont Ghost Town Scenic Drive leads to the old Sprucemont town site as well as the more interesting, in my opinion, Monarch Mine. The drive begins off US Highway 93, about thirty-five miles south of Wells and about eight miles south of the US Highway 93/Nevada State Highway 229 junction. The first twenty or so miles of the drive to Sprucemont follow an excellent condition gravel road that is wide, more or less flat and has few curves. Be warned, though, this road isn’t marked – so don’t waste time looking for a sign. 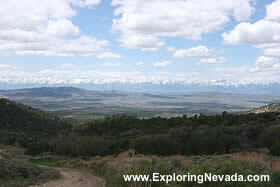 Instead, intuition combined with a topographic map book such as the Nevada Atlas & Gazetteer will help find the way. One helpful hint to find this road – the Spruce Mountain Road takes off to the east and is really the only “good condition” road that heads off into the desert and toward the mountains in the distance. All other roads are two tracks, or worse. When a traveler first arrives in Sprucemont, I suspect the first words uttered will be similar to mine - “so what.” And indeed, that’s a fair thing to say. 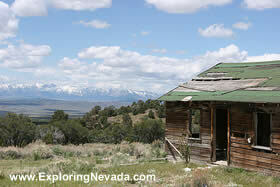 Only a handful of buildings survive, and there isn’t much to see other than the great view of the Ruby Mountains. However, what makes this drive interesting is what lays beyond Sprucemont on the steep, rocky road that leads up the mountain toward the Monarch Mine. This is where the drive gets fun. The road to Monarch Mine is a true 4WD drive road, not a wimpy “all-wheel drive” road. Unless you have a super powerful motor and aren’t especially picky about how your vehicle looks or what happens to it, most people venturing up to Monarch Mine will need to crawl up the mountain in 4WD low – otherwise the vehicle is likely to stall out. The road is extremely narrow and twisty, and very steep in spots (why 4WD low is needed). The drive from Sprucemont to Monarch Mine, while a rough and steep road, is only two miles long. Thus, if you don’t trust your driving skills or you arrived in a passenger car, the walk is reasonably short. Regardless of how you arrived, it’s well worth the time and effort taken to reach the Monarch Mine. Numerous old ruins still stand today, and the mineshaft is open and clearly visible. Indeed, someone super-adventurous (ok, stupid!) could probably have loads of interesting and memorable times heading into the mine to see what’s there. But that’s not something I advise. The views from Monarch Mine are outstanding. A visitor to Monarch Mine will have an unobstructed view of the entire Ruby Mountain Range as it stretches a hundred miles across the horizon. The massive Ruby Valley as well as Ruby Lake is also clearly visible. I’ve deliberately ended this scenic drive at Monarch Mine. However, the road doesn’t end here. The road continues beyond Monarch Mine, twisting its way over a high plateau. The road was snow covered when I was there, so I was unable to venture too far beyond Monarch Mine. However, for those interested in doing so, this road – called the BLM Road 1037 (knowing this fact won’t help in any way, however, since this road isn’t marked on any map or road sign) – meanders up the mountain and then drops back down on the other side. From there, the road heads off into the vast, empty desert of Eastern Nevada, eventually linking up with the "ever-popular" Nine Mile Canyon Road and, beyond that, the road that follows the Union Pacific railroad. In short, it’s a long, lonely drive through the middle of nowhere. As common sense suggests, services are less than abundant on this drive. Indeed, no services exist at all, nor are there any homes or even ranches. For supplies, the best and only real choice is in Wells. As for lodging, umm, need I say it? Bring a tent or camper. Although a person will have great difficulty, at best, dragging a camper up to Monarch Mine, the area around Sprucemont is “camper heaven.” Anyone setting up camp in Sprucemont will have excellent views and the place all to themselves, perhaps for days or weeks at a time! Overall, the Sprucemont Ghost Town Scenic Drive is ideal for anyone feeling adventurous and who enjoys seeing remote and historic places. Trip Length : Approximately 20 miles to Sprucemont off US 93. Another two miles to Monarch Mine. Junction to road that leads to Sprucemont is about 8 miles south of the US Highway 93/Nevada State Highway 229 junction. Road that leads to Sprucemont (the Spruce Mountain Road) is unmarked, but it's the only good condition road that travels east toward the Spruce Mountains in the distance. Road Type - The road is gravel/dirt for its entire distance. For the twenty miles to Sprucemont, the road is in good condition, relatively flat and wide. Between Sprucemont and Monarch Mine, the road is rocky, extremely narrow, rutted and very steep in spots. 4WD low may be needed to reach Monarch Mine. RV's / Campers? - Yes to Sprucemont, not advised or even possible to Monarch Mine. Services Available - Gas and supplies can be found in Wells. There is no place to buy supplies or gas on the scenic drive or anywhere close to it. General Location - Eastern Nevada, off of US Highway 93. Camping - The drive passes through BLM public lands for its entire length. Primitive camping is allowed everywhere. Bring your tent or camper, as there is no lodging or services of any kind on this scenic drive although there is lodging in the town of Wells. The drive passes through BLM lands for its entire length, so primitive camping is allowed everywhere. There is no developed campgrounds along the drive, either.